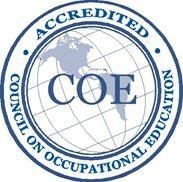 Eastland Fairfield Career & Technical Schools Adult Workforce Development (EFCTS-AWD) is accredited by the Commission of the Council on Occupational Education. The Council is a non-profit education organization recognized by the U.S. Secretary of Education as a reliable authority on the quality of education offered by the institutions that the Council accredits. The U.S. Department of Education Federal Student Aid program only permits schools to disburse Federal Pell Grants and Direct Loans if they are accredited by a Department-approved agency like the Council on Occupational Education. The Council has accredited the entire AWD division and it has accredited each of the school's full-time programs individually. The Medical Assisting program is accredited by the Comission on Accreditation of Allied Health Education Programs (CAAHEP) upon the recommendation of Medical Assisting Education Review Board (MAERB). Each course curriculum is designed to prepare students to take optional national and state certification exams many programs.